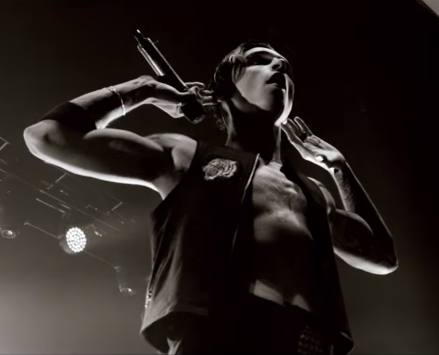 Now that the release of Andy Black’s (AKA Andy Biersack’s) comic book and sophomore album, The Ghost Of Ohio, is nearing, the singer elaborates new cryptic teasers for fans. He’s just dropped part 4 of his teaser, offering fans to call the same phone number as in previous teasers. Why? To hear one more spooky voice message. As the new album is said to have “songs that are dark, moody, gothic songs”, The Black Veil Brides singer has chosen a dark, gothic way of teasing fans too. The new “Part 4” post is accompanied by a weird, creepy photo of half of Biersack’s face. The Ghost Of Ohio is set to be released by Z2 Comics in March of 2019. Same as his sophomore album of the same name. The two releases reflect one another conceptually, so connecting the comic excerpts to teasing the album is only logical. The cryptic teasing, which started on Twitter three weeks ago, now went from “Part 1” to “Part 4”, each time offering fans confusing gothic photos and a phone number to hear a spooky recording, supposedly, lines from The Ghost Of Ohio comic. The latest “Part 4” teaser features the following recorded message: “In a time where fear controlled so much of the behavior and thought of their culture, they felt safe knowing that they had taken the appropriate steps to end their dread. They had believed that the ghost had put a curse on their town. And so before they buried his body, they removed his right eye and chopped off his hand. As the casket was lowered into the earth, they burned these parts and spread the ashes along the banks of the Ohio River. This was an ancient precaution taken to insure the ghost could no longer touch them or see them and therefore could not hurt them,” says Biersack on the recording. Check out the latest message and creepy accompanying photo below.